Good times, fresh espresso, and lots of hard efforts were had by all. Nytro was an excellent host for the ride this morning, offering both coffee and bagels, and plenty of space to gather. I had a bit of a rough morning (major bike mechanical, some hectic car interactions on the way over), but my spirits were lifted to see such a large group at Nytro – especially the large group of Team Fun members who managed to find each other amidst the dozens of riders gathering for the five levels of rides. While there have always been the brave women strong enough to keep up with the classic Swami’s A (Race) and B (Club) rides, I’m not sure the last time Swami’s saw the numbers of women that showed up this morning. It was certainly hard to get an accurate count, but there were certainly several more than were RSVP’d on Meetup (I am thinking in the 18-20 range). Aside from the big news of the ride start switching to Nytro, the other major news was the addition of our three group rides to the Swami’s offerings. Thanks to Julie, Heather K, and Michell for helping lead groups this morning. We will be repeating this route more often than other routes (you know, since it’s “world famous”), but it’ll be important to maintain our tradition of having group leaders while we all become accustomed to the route. I led the ride the Swami’s are calling the “Chasers” (or C, which was formerly our A – I know, it gets a little confusing). We had an awesome group, including both men and women, challenging each other throughout the approximately 40-mile route. Jill managed to herd everyone together at the second meetup spot (“the church” in Escondido) for a group shot. Daniel, Nara, Matt, Johnny, Fred (current Swami’s president), Kelvin, Linda, Susan, Heather B, Chris, Janice, Jenna, Doreen, with Darron in front on Jill behind the camera. While this route is fairly new to many of our riders, I have been doing this route almost since I moved here five years ago. In order to learn the area, I scoured local club sites for route ideas. I used to live in Aviara (Carlsbad) and so David (my husband) and I would head out toward San Elijo via Alga Road. For those of you familiar with our “sufferfest” hill rides, you will be familiar with Alga Road. That’s not a fabulous way to start this fairly hilly ride. However, it was clear to me midway toward the Elfin Forest turn in San Elijo that the Levante/RSF/San Elijo route is no joke either. That is a very long, very sustained climb, there’s no doubt. Thankfully it’s not steep, but that doesn’t mean it’s easy. I’m not sure it ever gets easy, but I’m sure that at some point you at least get used to it. Our group broke up a little on this stretch, but we did a little regroup right after the turn onto Elfin Forest. With a little refreshment, we were ready to continue on our way. Over the years, I have come to absolutely love the stretch of this route on Elfin Forest and Harmony Grove Road. I used to think the climb in the middle was endless and impossible (mainly because I always did it behind my husband, whose energy and speed seems endless and impossible), but I can say that part does actually seem like it’s gotten easier (there is some hope, after all). No one particularly loves the extra climb thrown in due to the construction that takes you out and around toward Country Club, but hopefully that stretch will get back to normal soon enough. At least you know when you hit that spot, you’re almost at the major rest spot on the ride – “the church” in Escondido. This spot is approximately midway through the ride, and you know at this point all the longer climbs are behind you. Jill Q and Janice warming up on La Costa, with Heather K and Doreen behind. Some people tend to think of the rest of the ride as “downhill”. Those people will be severely disappointed at several spots along Del Dios, and especially through the last three miles as you wind up, down and around rollers heading out of Rancho Santa Fe. 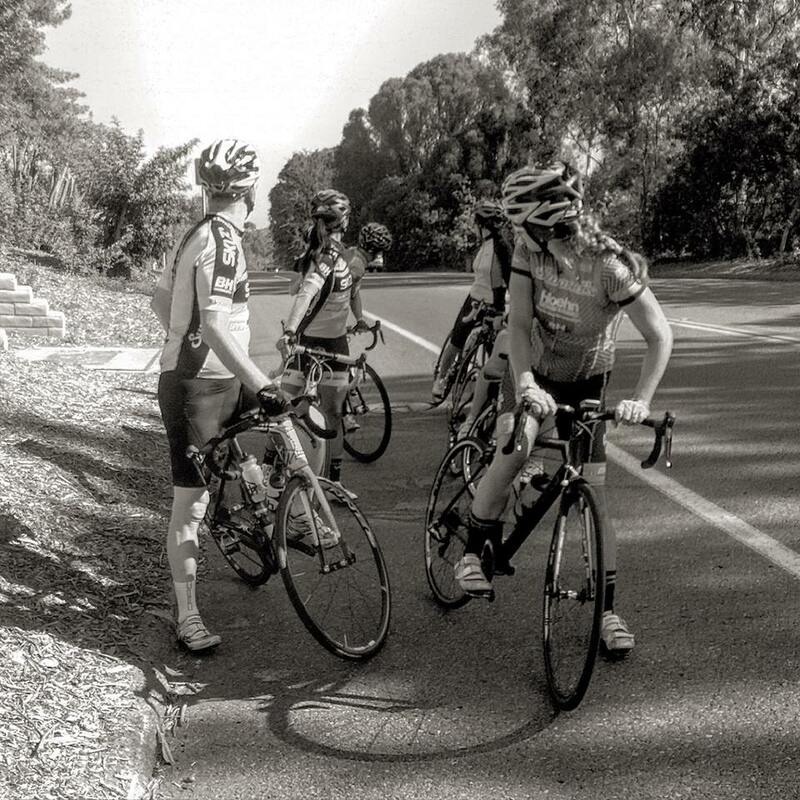 The group rode strong the entire length of this section, and after a brief regroup in Rancho Santa Fe, cruised into the finish. If you weren’t hungry or thirsty at the beginning of the ride, the bagels and espresso were still available at the end. Having the bike shop open at the beginning and end of the ride is also extremely convenient for picking up the essentials such as spare tubes and nutrition – or in my case, a new helmet to replace the one I hit my head in during my crash a few weeks back. One of the benefits of joining the Swami’s club is the discounts you receive at Nytro – the discount is 20% for anything in store or on-line. It’s a large store with great selection and helpful employees. Make sure to look around next time you finish a ride. 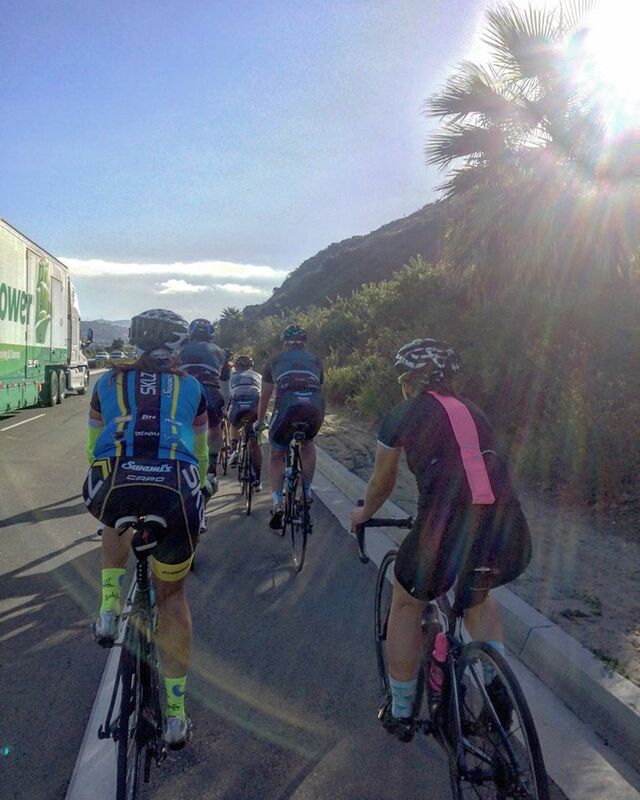 Tomorrow (10/4) is the monthly Swami’s Social Ride, meeting at Bressi Ranch Peet’s at 8:00 am. We are all hoping the rain holds off, since this is a truly enjoyable ride followed by treats and coffee paid for by Swami’s. The route is 30 miles with frequent regrouping. 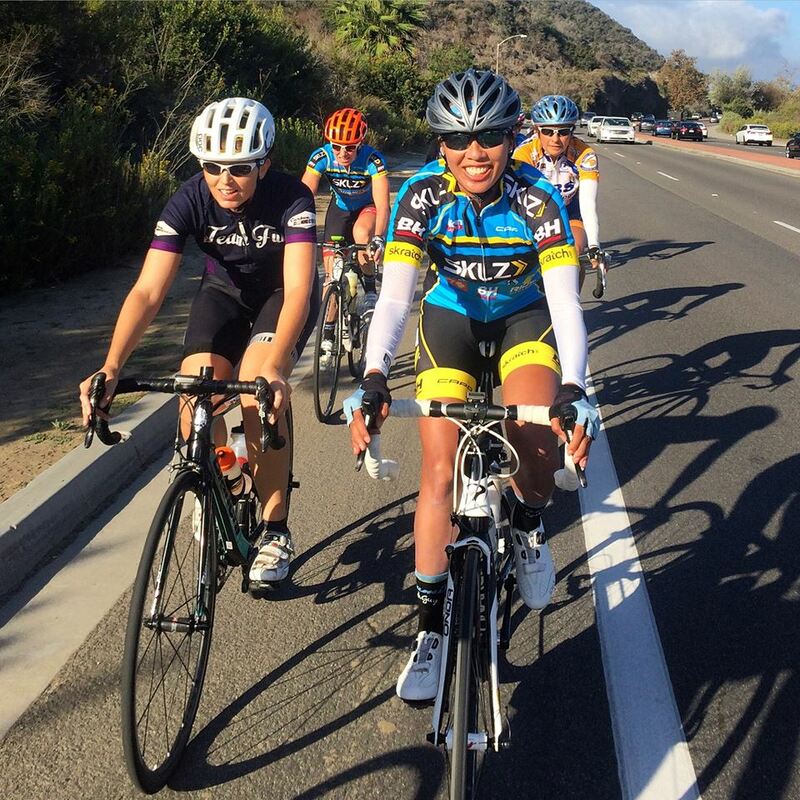 Next Friday (10/9) we will again be hosting our weekly coffee ride, starting at 9:00 am at the Ralph’s Shopping center off Avenida Encinas in Carlsbad. 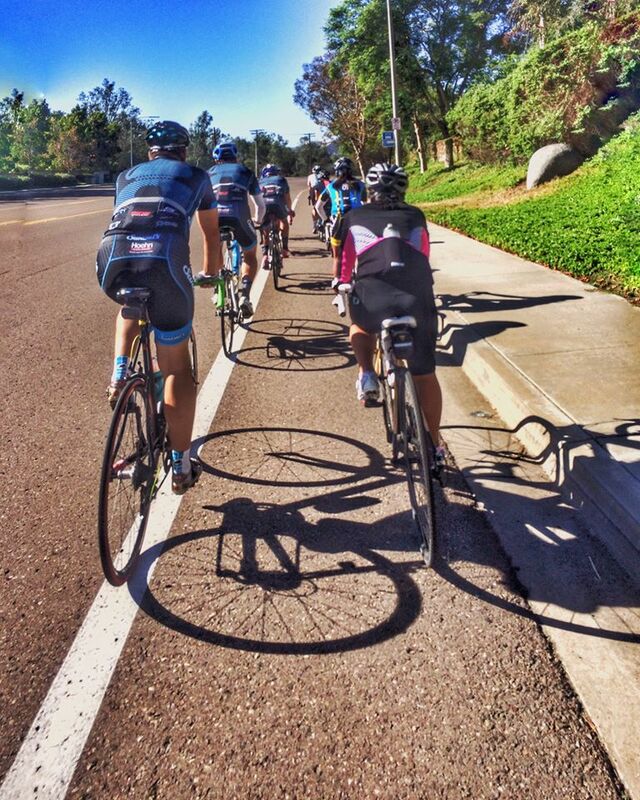 This ride will head south this week to Del Mar, for about 25 easy miles. Coffee stop to be determined. Next Saturday (10/10) we will be meeting again at Nytro as we will be every Saturday morning around 8 or so, with the rides leaving around 8:15-8:20. 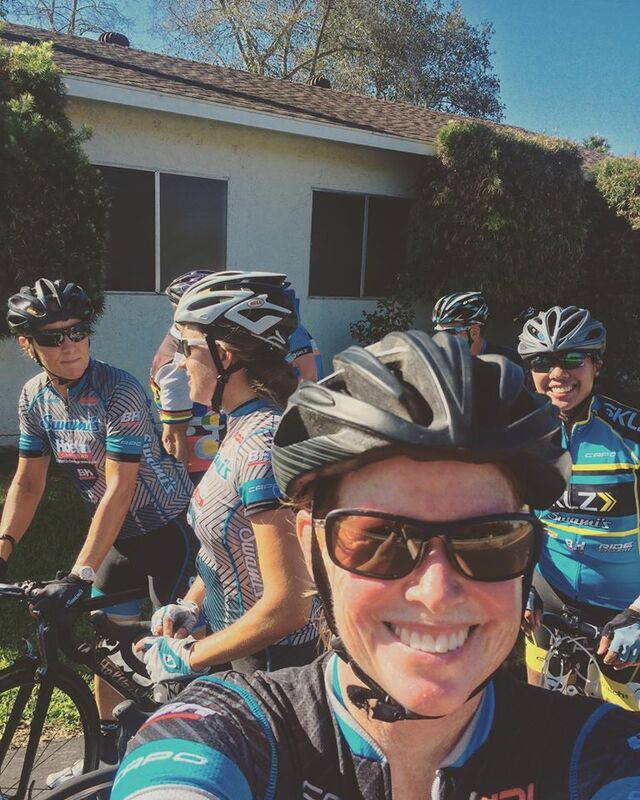 Stay tuned for the route – I think we will be mixing it up this week with an Italian Theme (see Heather K’s post about our Wednesday ride this week). Swami’s Club Night, Thursday 10/15 from 5-7:30 at Hoehn Mercedes in Carlsbad. This will be a night of amazing deals – Swami’s President Fred Muir is posting on the Swami’s Google Groups detailed information on why you will want to attend this event. Please check those out to see what that’s all about. This will be my first year at one of these events as well. There will be deals on all kinds of bikes, equipment and accessories, along with pizza and beer and great camaraderie. As always, you are welcome to join all of our rides and events as a “Friend of Swami’s”, but hope you consider joining the club in order to take advantage of things such as the Club Night, the new 2016 kits, and the discounts at Nytro. The Swami’s website allows you to sign up online. Although I will repeat so it’s clear, everyone – regardless of your kit, speed or membership status – is welcome to attend our rides. 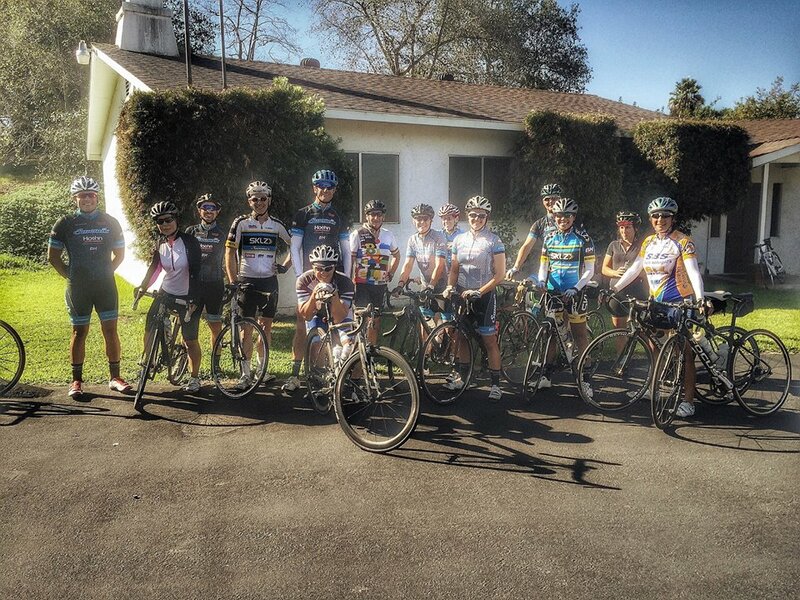 We are passionate about growing women’s cycling!